Jacobsen reports another interesting example of organocatalysis, here using a chiral guanadinium salt to catalyze the enantioselective Claisen rearrangement.1 As an example, Reaction 1 proceeds in 6 days at 30 °C to give 81% yield with an ee of 84%. The system is also diastereoselective, so that Reaction 2, run for 6 days at 40 °C, gives an 82% yield with a diastereomeric ratio of 16:1 and an ee of 81%. B3LYP/6-31G(d,p) computations provide some insight. The uncatalyzed reaction of 1 to give 2 is predicted to be exothermic by 16.1 kcal mol-1, with an activation energy of 25.9 kcal mol-1. Using N,N’-dimethylguanidnium as a model for the catalyst (and with no counter anion and no treatment of solvent – hexanes in this case), they find a complexation energy of almost 27 kcal mol-1 for forming 3. 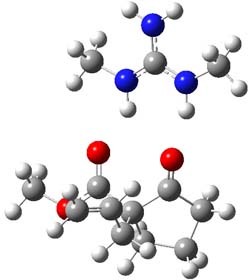 3 exhibits (See Figure 1) three hydrogen bond-like interactions – one N-H bifurcates to interact with the carbonyl oxygen and (a very long interaction) to the other oxygen. The product complex 4 also shows three hydrogen bond-like interactions, with an overall exothermicity of -14.7 kcal mol-1. The complexed transition state 5 has two normal length hydrogen bonds, with an activation energy above 3 of 20.6 kcal mol-1. Thus the complex lowers the barrier by about 5 kcal mol-1, indicating the catalytic effect. They have not however addressed the enantioselectivity. Figure 1. B3LYP/6-31G(d,p) optimized geometries of 3-5. I suspect a lot of the catalytic and enantio/diastereo selective mechanisms will have, in the end, to be re-investigated using dispersion- and solvent-corrected methods. B3LYP is increasingly under suspicion for not being appropriate for the former at least. In 2005, we investigated diastereoselectivity in lactide polymerisation using B3LYP, getting the correct answer (DOI: 10.1021/ja043819b). In fact, the mechanism in that case involved two possible rate determining transition states, TS1 and TS2. We got the correct answer by suggesting TS2 was appropriate. A more recent re-investigation using dispersion and solvation corrected methods re-assigned the rate determining step to TS1, although the final stereoselectivity (fortunately) turned out as before! 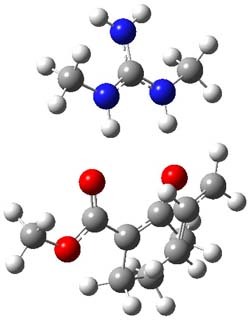 And, for good measure, interactions from a counter-ion may also have an effect (DOI: 10.1021/jo1002906), although I grant that tetraphenylborate is pretty non-coordinating. 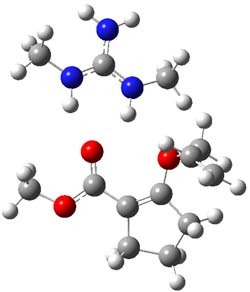 However, the prospects of building realistic and effective models of many enantio- and diastereoselective reactions with significant ionic components are very exciting. I predict the next five years will be a golden period for this sort of modelling.